New Wasps signing Kurtley Beale will miss the start of next season but his knee injury is not expected to keep him out for as long as first feared. 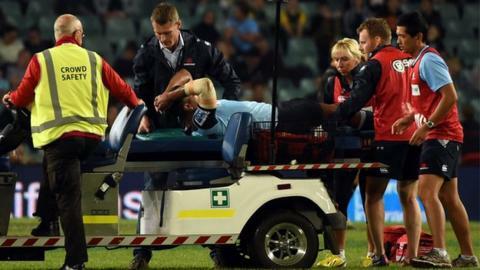 It had been thought the back would miss up to a year after he was injured playing for New South Wales Waratahs. But a scan has revealed he has torn his patella tendon clean off his kneecap, and will now be out for "four to six months", the Waratahs said. The versatile 27-year-old Australia back will have an operation on Monday. Beale, who has won 60 Australia caps, sustained the injury less than a day after it was announced he was joining Wasps in a deal that is understood will make him the highest-paid player in the Premiership. He was hurt as he challenged for a high ball in the first minute of the Waratahs' Super Rugby victory over the Bulls on Saturday. It had been feared he had ruptured the tendon, but scans revealed it was torn off entirely. "The result is the best possible prognosis given the tendon remains intact, requiring less invasive surgery, and that the injury is isolated with no other damage to the knee," said the Waratahs on Sunday. The patella tendon connects the knee cap (patella) to the shinbone (tibia).